Grandpa loved to tell stories. During our family visits to his home in New Jersey, we were a captive audience. One story in particular changed forever the way I thought about food. As a child, I sometimes tried to hide when my grandfather began telling a tale. I was a boy, and I wanted action! But this time, I found myself riveted in place as he reminisced about finding a miraculous treasure – a raw onion. He told of how he ran off to a safe haven, hidden from his hungry brothers, and ate it with much pleasure. To him, any food was a delicacy! This food memory, culled from a smorgasbord of events archived in his brain, was much unlike those of my favorite culinary experiences in my youth. I still salivate while recollecting a two-layer chocolate cake, chocolate icing speckled with MM's... later to become a birthday tradition. Even as a child, just hearing about nothing more to eat than a raw onion was enough to bring tears to my eyes. Food was scarce on the Romanian tobacco farm. Only the money purse held more emptiness than my grandpa's belly. After emigrating to the U.S., life was better for Grandpa, but he had a new problem. His lack of sustenance during childhood may have led to his difficulty to stop eating when at a healthy point, especially when faced with an all-you-can eat buffet. Even without such humble beginnings, chances are we all could benefit by decreasing the amount of food we consume. Overeating causes many health issues - both physically and mentally. Portion control in the U.S. has gone wild. American’s think BIG! We love to super-size everything from meals and cars to teenagers’ pants and, with the help of wholesale stores, toilet paper packages. Our shopping carts dwarf those seen in my travels to European countries. Overshopping can lead to overeating, which has many causes. If your reason involves an eating disorder, an emotional or medical issue, please seek professional care. New research published in the Journal of Neuroscience finds that obese people have fewer pleasure receptors related to eating. The study revealed that it takes greater quantities of food in these individuals to have the good feeling that results from eating. The tale at the table gets worse. The evidence also finds that when overeating occurs, the pleasure receptors in the brain involved with eating weaken.1 These findings may explain one reason why overeating can increase a person’s risk of future weight gain. This research brings hope that new methods for preventing and lowering obesity will arise. Just knowing that one may be at risk can prove helpful. Much like the awareness of a family history of heart disease leads many relatives to change certain behaviors. You may be more inclined to exercise and consume heart-healthy foods. Studies have shown other explanations for overeating. All foods fall on a scale based on the ratio of the nutrient content to calories. Foods high on the scale would have a large amount of nutrients, but few calories. These substances are known as nutrient dense. Brussels sprouts are a tasty example. Items low on the scale have a minimal nutritional value, but many calories. A potato chip would fit this category. 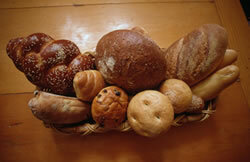 Good carbohydrates are essential for health. Choosing nutrient dense fruits, vegetables and whole grains that are high in fiber helps keep insulin levels at a healthy balance. Especially around holidays, at parties or family celebrations, when many sweets are consumed and portions are larger than normal, a little planning can keep the insulin roller-coaster ride short. After overeating behavior that ramps-up the insulin levels, take at least three days and intentionally eat less while making healthy food choices. It also helps if you remove all sweet offenders from your cupboards. Just start with three days. You can do it! After a period of taking out the garbage-hydrates, it gets easier and better choices happen naturally. Shop wisely by making nutrient dense food choices. Vegetables rank the highest with Kale, Collards, Spinach and Romaine lettuce at the top of the standings. Leave the Garbage-Hydrates at the store! Eat less. Increase the vegetables on the plate by 25% and decrease everything else by 25%. If you have a true hunger by the next meal, you are doing well. After overeating, take three days with conviction to eat less and to only eat nutrient dense foods. Just make it happen… it’s EASY! There are other reasons people overeat. Chances are that if you did not grow up in rural Romania during the early 1900’s, you are like the rest of us. You overeat due to choices that you are consciously or completely unaware of making. Much can be done to control the unhealthy over-consumption of food that has tipped the scales of American health. Eat wisely, for the fork is mightier than the pen. Anyone can write about change, but it’s when you lift your fork that your life is affected.